The sight and sounds of Vail’s signature mountain stream create the perfect setting for cozy winter breakfasts, tranquil summer fly fishing or peaceful nighttime slumber. This beautiful private home is situated along the banks of Gore Creek, the sparkling ribbon that weaves through Colorado’s premier outdoor destination. The owners have lived and traveled extensively throughout Europe, and the home is filled with the many treasures they have collected over the years. Beautifully decorated with the guest’s comfort in mind, two rooms with private baths await the discerning traveler. 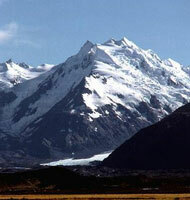 The atmosphere of Alpine Creek Bed and Breakfast reflects the lives and love of the owners. Trudie Olson Engel is of Swiss heritage and education. Rick Engel teaches skiing part time at Beaver Creek. They and a resident host specialize in anticipating and meeting the needs of their guests. A hearty breakfast is served each morning during the ski season, and a lighter fare is offered in the summer. There are many specialties of the house along with hot beverages, juices, muffins bagels and cereals. Live like a local, and play like a guest! Join us for the most memorable Rocky Mountain experience around. NEW: High speed wireless and wired internet connection available! 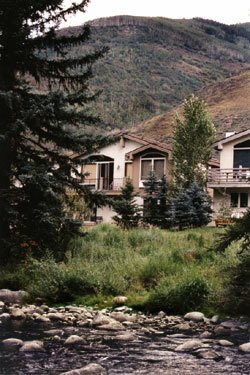 Looking across Gore Creek to Alpine Creek Bed and Breakfast. Walk out from the guest room deck to this tranquil spot. 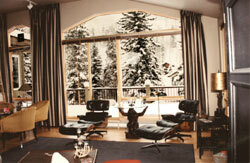 A winter wonderland framed by the Alpine Creek's great room windows. Gore Creek and Vail Mountain are right outside.